Before registering, remember to login or create a profile if you would like to track your participation. To pay by credit card after you complete the process, you will be taken to a PayPal screen. At this screen you can pay by PayPal or scroll down to pay by credit card. If you close this window your registration will not be complete. NOTE: If you are registering someone else, do NOT count yourself, you can change the registrants information below. You can use your email for tracking purposes. I will send payment by check. If check is not received within 10 days your registration may be canceled. If you would like to create an account on this site, check the box below and enter a user name	and a password	. If you already have an account, please login before completing this form. 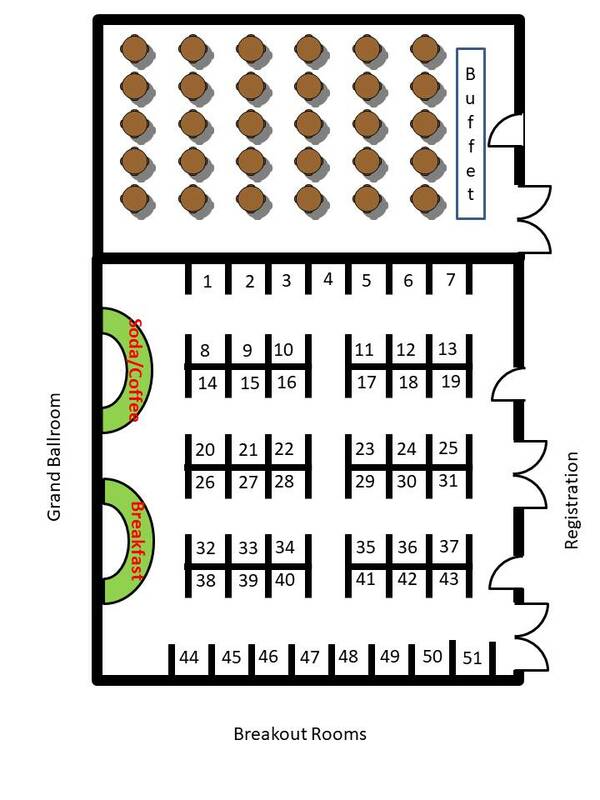 You may select as many booths as you want by clicking on the booths you would like. You can de-select a booth by clicking on it a second time. 1: STAT First Aid & Safety, Inc.
17: Law Office of Adele L. Abrams P.C. 22: Burlington Safety Lab, Inc.
26: Rescue One Training For Life, Inc.
34: W. W. Grainger, Inc. Please enter the name of the primary contact for registration information. Booth attendee names will be entered below. Please enter primary contact email. Cancellation Policy: Cancellation requests must be received in writing to: MACSC, P.O. Box 3186, Frederick, MD 21705 or email info@macsc.net, by midnight 45 days prior to the event. These cancelations will be subject to a $150 assessment. There will be no refunds within 44 days of the event. Sorry we cannot accept cancellations over the phone. We reserve the right to change reservations. The conference and its organizers cannot be held responsible for the safety and security of exhibitor property left on the conference premises. Exhibitors are expected to maintain insurance of their own property as the conference will not be providing such coverage. NOTE: Limited time promotional pricing is non-refundable. Please note that clicking on Skip Participant will skip past adding any additional attendees.